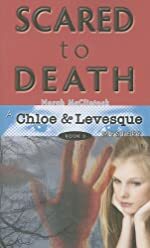 Scared to Death is the third book of the Chloe and Levesque series. Scared to Death is written by Norah McClintock. Scared to Death is a great book. It is suspenseful and has amazing descriptions. It is a story that keeps you on the edge of your seat. I especially enjoy the main character, Chloe. Chloe is an excellent detective who I admire for her intelligence. The author does an awesome job creating Chloe. The story is so magnificent and thrilling from the very beginning. You just never want to stop reading because it's so good; I was hooked from page one. Also the characters are so interesting and life-like. It's as if you're right next to Chloe trying to solve the mystery. I love that the ending of the story is very much unexpected and surprising. I am personally a huge fan of the Chloe and Levesque books. They are all awesome stories. I admire and enjoy Norah McClintock and her work. She has many great books and is a wonderful writer. No matter what your preferred genre is, I recommend Scared to Death to anyone looking for a good book to read. We would like to thank Kane Miller for providing a copy of Scared to Death for this review. Have you read Scared to Death? How would you rate it?